Greece's prime minister Alexis Tsipras is on a landmark visit to the newly renamed North Macedonia after a decades-long identity row between the two countries. 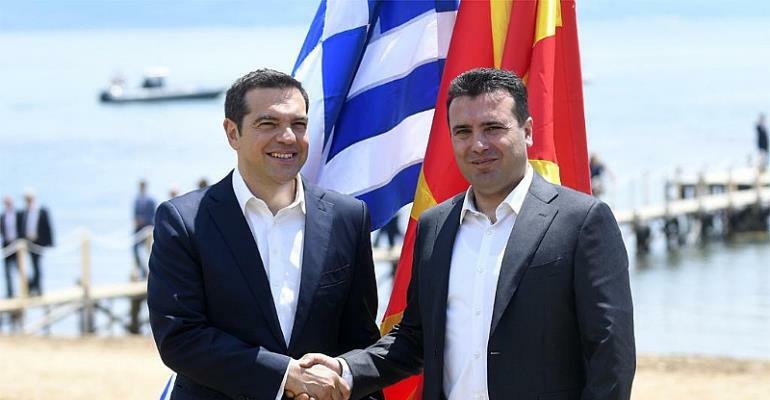 "The first prime minister of Greece to visit North Macedonia. Truly historic day," Zaev wrote on Twitter beneath a photo of the two leaders embracing outside the government building, where they took a selfie before entering inside. Tsipras is joined by 10 ministers and more than two dozen Greek business leaders with him who will attend a business forum in the afternoon. "It is our responsibility -- mine and Zoran's -- to show that our nations can only benefit from the path that is now open," he said, condemning "rising forces of nationalism". Disgruntlement is also palpable in Skopje among some who feel the name-change is an embarrassing concession to Greece and that the end-goal -- entry into the EU -- may never materialise.